"Humpty Dumpty" nursery rhyme is sung to the traditional Irish hop jig “Off She Goes” which was probably written in the late eighteenth century. Five voices sing the last line to represent all the king’s men who “couldn’t put Humpty together again.” Banjo, fiddle and accordion play the musical links and instrumentals. We finish by playing the full tune so children can perform a hop jig step dance to the Irish music. Click on the play arrow above to listen to our version of Humpty Dumpty set to Irish music for kids. Go to our Humpty Dumpty page where you can share our nursery rhyme with your friends and/or buy the MP3 download. 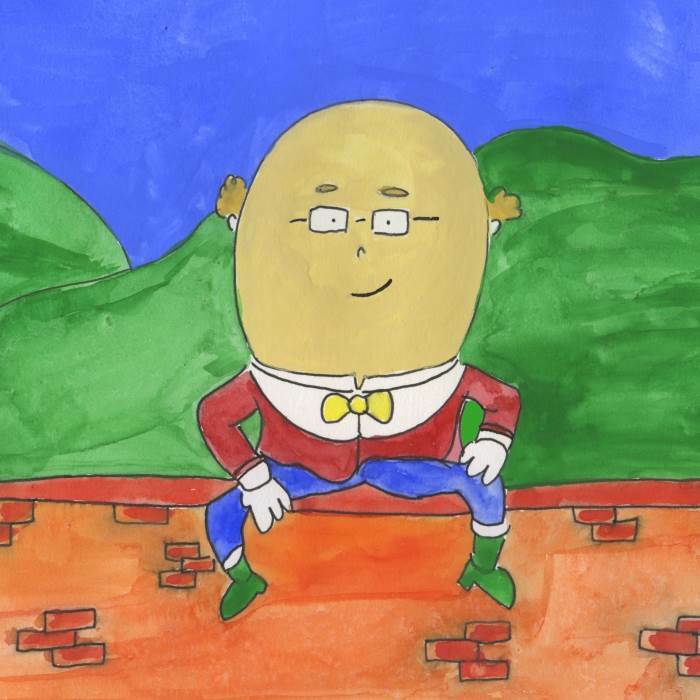 Click on the arrow below to watch our youtube video clip of "Humpty Dumpty"
Art: Humpty Dumpty is usually depicted as an egg. Introduce oval as a new shape and draw portraits of Humpty Dumpty. Social, Environmental and Scientific Education: Birds, reptiles (crocodiles, turtles, etc) and two mammals (platypus and echidna) lay eggs. Dinosaurs also laid eggs. What else lays eggs? Are they laid in a nest, buried in the sand or laid in a burrow? What types of eggs do we eat? Read "Chickens aren't the only ones" by Ruth Heller. Physical Education: Run (hard boiled) egg and spoon races. Hard boiled eggs are less messy! Use large dessert spoons as they’re easier to manage.